Dr. Dirk Neumann (CEO and CRO at Scientific Consilience) holds a diploma in chemistry and a doctoral degree in natural sciences (Dr. rer. nat.). 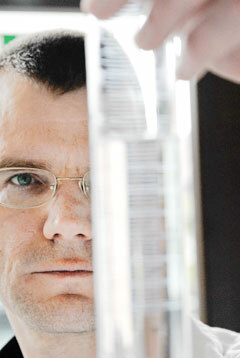 Always interested in interdisciplinary research, he pursued his doctoral studies in the department of Biopharmaceutics and Pharmaceutical Technology (Saarland University) with a focus on assessing the lectin-carbohydrate interaction by performing both cell culture experiments and molecular modelling. After a short term as postdoc at the Center for Bioinformatics, Saar (CBI) he became the leader of the independent junior research group Drug Transport at the CBI. In this prolific and highly interdisciplinary environment, his group addressed a variety of scientific challenges including improved algorithms for flexible protein-ligand docking, fast modelling of transport into and through human skin, and the design of modern drug carrier systems. Following his more than six years at the CBI, he worked as a freelance scientific consultant before Scientific Consilience was launched. Dr. Neumann has been reviewer for several journals including Skin Pharmacology and Phyisiology, European Journal of Pharmaceutics and Biopharmaceuticsand Molecular Informatics. At the University of Bonn, Dr. Neumann has been teaching Mathematical and Statistical Methods for Pharmaceutical Scientists for several years.